When thinking of Augur Lake, it’s always nice to imagine splashing around in the swim area, steadily paddling a canoe to Blueberry island, practicing wet exits in a kayak, taking a paddle board to Whip island, rowing out to your favorite fishing spot, making perfect tacks on your windsurfer or sailing into the Augur. The reality now is that the lake is much better suited to ice skating, ice fishing or ice sailing. With a layer of approximately 18 inches of ice on the surface, it is anyone’s guess as to when we’ll be able to enjoy activities on Augur Lake that don’t begin with the word ‘ice’! Parents of campers at North Country Camps know that during the summer, we send out regular bulletins, describing what’s happening at camp. Each Fall, we take excerpts from these bulletins and construct a document, with pictures, that can be given to prospective families who are interested in reading more about life at Lincoln and Whip. We thought everyone might enjoy taking a look this year. This second installment will cover trips, special events and the end of the summer. For NCC alums, it should be a walk down memory lane! *Note: The descriptions switch back and forth between Lincoln and Whippoorwill, but what’s happening at one camp is quite similar to what’s happening at the other! As mentioned in our first account the youngest girls learn all about how to set up a campsite on their cookouts in and around camp. They practice setting up tents, building fires, cooking delicious meals and hear about leave no trace ethics. This sets the stage for bigger forays into our surroundings. Typically, we’ll start day trips on the second day of camp, so campers can work on building stamina and strength, but also enjoy short introductions to the trip experience. As the first couple of weeks unfold, campers from all ages, start heading out on overnight camping trips – some close to home and others with a service focus, like collecting trash from Valcour Island, or exploring new areas. Our extended trip program really gets into full swing by the fourth week of camp, which encompass trips of three, four or five days out in the woods. Often, hiking trips of this length require a portion of backpacking to a campsite area, from which the group will take day hikes. We have sent out several extended canoe trips to various lake chains and rivers, including the newly opened Essex chain of lakes. Some canoe trips can paddle unimpeded for days, but many involve portages, where the boys must carry all of their gear and the boats from one body of water to another. This is hard work, but it gets you away from the crowds and there are very few things in life as beautiful as the sound of loons crying out on a remote wilderness lake, while you drift off to sleep. Mountain climbing trips are quite popular. We send out many of these trips each summer and have already had groups camping and climbing in the McIntyres, the Great range and the Gill brook and lake Colden regions. And, when a trip group finds itself back at the van, it’s not really over yet. There is, of course, the traditional ice cream stop on the way home and after that, the boys are involved with unpacking the trip. Cleaning trip dishes, putting away equipment and hanging tents to dry are all important tasks that must be done by the group. This is all part of our philosophy of teaching the kids every aspect of an activity. Every camper has a different level of involvement with trips at camp and it is a truly personal decision as to what your goals may be. For some, the drive to hike as many different mountains and perhaps attain ones 46er is an integral part of their North Country Camps experience. Others are keen to take on challenging water trips and create memories on remote waterways. Several girls simply play each summer by ear and leap at an opportunity that interests them in the moment, such as an exploratory trip or one that focuses on creative cooking. We hope that everyone develops some level of attachment to being outside in new surroundings. With our range of different options to adventure, girls tend to find that during their years at camp, nature becomes ingrained in who they are. There are opportunities for us to spend time with our Lincoln counterparts during every-day activities like Riding, Ropes and mixed field games, yet a highlight is when the boys join us for a picnic on the field. It’s so nice watching brothers and sisters catch up and share stories about their adventures. Four times during the summer, we get together for a concert, where we watch and perform all kinds of skits, songs and dances. This is something that can be very fun for campers to take part in, as it’s a really safe environment for getting on stage in front of a supportive audience. It is also great entertainment for those who get to enjoy viewing the various performances. In addition, the girls and boys spend Friday evenings in various mixed activities. This year the Juniors had a great time playing ‘Salad bowl’ – a spin off from scattergories and charades rolled into one. The birdies and cubs enjoyed an open waterfront at Lincoln. There was a very exciting Casino night for Juniors, Cubs and Birdies, with card games, popcorn and a Roulette wheel, which is often a high spot. The seniors spend their Friday evenings dancing in the red Barn, although some prefer to play card games outside on a blanket. One of the absolute favorite evening pastimes is our annual square dance on the Lincoln field, called by our good friend Bruce. Who doesn’t love an opportunity to do-si-do the night away? We were also lucky enough to come together in the Red barn to enjoy a performance by good friends Roy Hurd and Skip Smithson. Everyone loved the story telling and classic Adirondack songs – particularly singing along to “Adirondack Blue”. The end of a camp season is the time for annual rituals like the Chief’s Cup sailing race, the Pinewood Derby and the horse show. The Chief’s Cup is a long-time tradition at Lincoln, where the best sailors at camp compete against each other to see who’s the fastest. The twists and turns of the race also test a skipper’s ability to handle the boat and direct his crew. Congratulations to Sam, this year’s winner! The pinewood derby is a race between the many small, wooden cars that boys build in the woodshop each season. Awards are given for the fastest car and for “best in show.” The race itself is a wonderful spectacle; the whole camp gathered around the track, cheering, shouting and groaning as the races unfold. Some cars speed straight down the track, while others bang into the wall and sometimes come apart in spectacular fashion. It’s almost as much fun to watch the crowd’s reaction, as it is to watch the race! Our annual horse show was held on Sunday morning. It’s a chance for the riders to show off their skills in front of the whole camp. Events include barrel riding, an obstacle course and jumping. We have some very talented riders here! Perhaps the event kids look forward to the most each summer, is the final banquet. On our second-to-last night of camp, we hold a themed feast to celebrate the summer. Much debate goes into each year’s theme. Kids discuss this topic frequently, but when the votes were cast this summer, the winner was “Jurassic Park.” The art shop spent the last week of camp furiously creating decorations for the banquet. Each boy dressed up to match the theme and at Lincoln, our staff M.C.’s led the whole camp on an exciting opening adventure, chased by the sounds of marauding dinosaurs, until eventually we arrived back at the lodge. Our porch section had been transformed into a narrow tunnel, which boys crawled through, to reach the main dining hall (now the command center for all of Jurassic park). The decorations were amazing, and many boys were impressed by the dish-room, which had become the mouth of a huge T-rex! Our wonderful kitchen crew outdid themselves with chicken, corn-on-the-cob, fritters, salad and rolls, not to mention a delicious desert. The boys celebrated another great summer, ate well, danced and we finished the evening off with a slide show from this summer and our annual workgroup awards, where the oldest campers leave their love of various aspects of camp to younger boys. It was a great night. The final couple of weeks at Whippoorwill provide a lot of anticipation as preparations take place for several end-of-season events. Sailors train for the Farrington Cup race and Riders practice for the horse show. We all vote on a banquet theme, and work hard making decorations to transform our dining hall. Cabin groups also create a skit to perform after dinner. New York City was our theme this time, which gave everyone plenty of inspiration! The evening began with our MC’s based at a Macy’s day parade complete with commentary from the TV reporters. The lead float took a wrong turn and disappeared into a subway station, leading all of the campers with them into our fully New York Citified dining hall. We feasted on Chips and Tzaziki, Pizza and pigs in blankets, egg rolls and Lo Mein as well as large soft pretzels, fritters, cheesecake and black and white cookies. Girls plan carefully for their peanut present gifts for the last couple of weeks. After picking a peanut shell, which contains another campers name, we make a gift to be exchanged at final sing, using supplies found around camp. The Work group led us in council fire and started the gift giving chain. It is always fun to see who made gifts for whom and it’s a neat way to end the final evening of camp. On Monday evening at Lincoln, we held out final council fire in the back of the lodge. Quite a few awards were given out, including many that involved years of hard work to achieve. Such is the case with the “Voyageaur” patch, the highest rank in canoeing. Some years pass without a single one, but this year two boys earned that rank. It’s always fun to listen to Emily’s tally of the number of mountains climbed, lakes paddled and which campers logged the most miles in the woods. We sang some songs, told a short story and enjoyed being together for a little while longer. As always, it was a mix of emotions for many boys, who were excited to see their families again, but also sad to be leaving camp. It was the end of a fantastic summer! In March 2012, Barry Needleman and I climbed Noonmark with Neil Van Dyke. We had a great time and wondered why we didn’t spend more time out in the mountains during that time of year. On the descent that day an idea was born: climbing the 46 in winter. We had each climbed a few High Peaks in winter in prior years but those were only sporadic efforts. 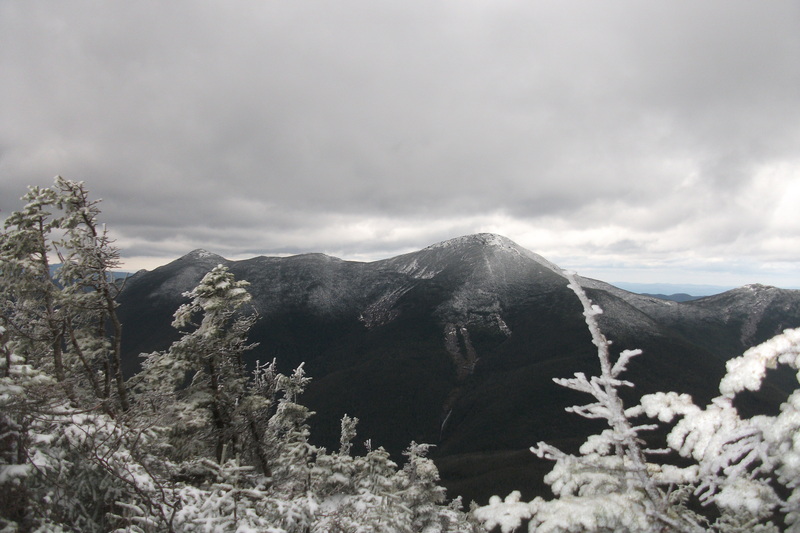 In January 2013, we set out to chase our goal, starting the challenge with a hike up Whiteface and Esther. It was a fun, tough start – the temperature hovered near zero all day. Since then we’ve climbed more than twenty peaks together through wet snow, packed snow and fresh powder that went up to our waists. Alumni from both Whippoorwill and Lincoln have joined us on our various adventures, including Neil, Jack Schneider, Will Holland, Chris Freyer, Robin Gucker, Ruth Needleman, Paul Sonneborn, and Paul Ferrari. We’ve also each climbed solo on a few occasions. Will and Ted's excellent adventures! The difference between winter hiking and summer hiking isn’t just the cold, snow and snowshoes, it’s the many extra layers, three hats, four pairs of gloves, frozen water bottles, and frozen peanut butter and jelly sandwiches. Best of all, there are no bugs in the winter and there’s no mud, roots or rocks – when the trails are packed you can fly along like walking on a smooth snow sidewalk. Insulated boots with microspikes, crampons, or snowshoes enable you to move forward towards your destination safely and in comfort. The summits remain breezy and beautiful, though completely transformed once the snow and ice lay cover on the crown. With temperatures often below zero up top, there’s usually just enough time to take a picture before heading down to the protection of trees for a quick snack. The coveted summer-time slide-climbs are highlighted by the snow, allowing one to dream of the fun to come in warm weather. There are days where a five minute break is too long, for coldness sets in quickly; conversely there are days where the sun warms you and longer breaks are welcomed when graced with slightly warmer temperatures. Although people do camp in winter, we’ve chosen to do all our climbing as day trips. That means in comparison to summer camp trips, we’ve ended up climbing some odd combinations of peaks. For example, we set out a few weeks ago to climb the Lower Range, but only got as far as Upper and Lower Wolf Jaws because so much deep, fresh snow slowed us down too much to continue that day to Gothics and Armstrong. So we went back a few weeks later for a Gothics and Armstrong day trip from the Ausable Club. That’s another major characteristic of winter climbing – the weather and conditions often have a major effect on your plans, and frequently prevent you from doing what you intended to do. You always have to be smart, and recognize your limitations. Being careful in the mountains is always important, but especially so in winter. I plan to follow up this post with trip reports about each of our climbs. We’re also hoping to do a slideshow this summer of photos we’ve taken over the last two winters. So stay tuned, and who knows – maybe next winter some of you can join us on our hikes as we head toward our goal of finishing on Phelps on March 8, 2015. Each year, at the end of the summer, Kate and Doug condense that season’s parent bulletins into one document, which we give to prospective families. It’s a great way for them to get a sense for what’s happening at camp over the course of a summer and we thought you all might enjoy seeing this year’s version. It will be a nice trip down memory lane for some of you and perhaps a good link to send to any friends you think might like to join us next summer. Enjoy! The beginning of another camp season is much like a birth. There’s anticipation, nervousness and above all, a lot of excitement for what is to be! Each summer is different and this one certainly has spirit! The thrum of excitement at Horace Mann was unmistakable as the buses arrived to transport our campers to camp. Good cheer assisted parents as they slung their children’s bags onto the van and buses, and wished their offspring good luck. Children waved goodbye with anxious joy, but quickly turned their attention to catching up with chums old and new. After a long drive up the Northway, we eventually pulled onto Frontage Road and spilled out onto the field at Whip and the driveway at Lincoln. The boys and girls streamed off the buses, full of that spirit and ready to begin the fun. They met quickly with the camp nurses, picked beds and moved into their cabins. Many took a refreshing dip in the lake before heading up the hill for a delicious dinner. After a month of setup work around camp, with just a handful of counselors around, it felt great to see, hear and feel the full dining halls again! The weather has been less than perfect, with periodic rain storms coming through our area. We set new records for rainfall in June and so the ground has been soggy. A few particularly wet areas of camp have trails of “wood cookies” (sawed from logs) leading through them, but any inconvenience we feel seems to be lost on the kids, who see these trails as little adventures! Indeed, the weather does not seem to be impacting the happiness and excitement of the campers, who rightly point out that all this water just makes more lake for swimming and boating! As I sit and write today, the weather is perfect; warm, sunny and the forecast looks good for the next few days, so hopefully we’re turning a corner. What a difference a couple of weeks can make when it comes to the weather! From the record-smashing rains of June and early July, we’ve moved on to dry, sunny days, perfect for camp. The mud is gone and the girls and boys are hard at work (the work of having fun, that is). WHIPPOORWILL pulses with vibrant energy, constant chatter, cheer and singing as the morale is quite high. Our weeks have been jam packed with adventures, entertainment, learning and creativity. Campers choose their morning activities on a weekly basis, which allows them the opportunity to really develop some core skills that will provide a foundation for being proficient. We have offered many of the classic activities such as Kayak, Windsurf, Archery, Riding, Ropes, Drama, Sailing and Tennis. For some of our other traditional activities, we included a unique spin by making it possible to take “swim team,” which focused on speed, racing strokes and techniques. In dance, campers learnt ballroom steps, including the waltz, which they choreographed to more contemporary music. Girls practiced Ultimate Frisbee for an upcoming game with a neighboring camp, and crafters worked on making Clay Mobiles throughout the week. In addition, Birdies went to help pick out our new animal additions, baby dwarf rabbits – you can only imagine how cute they are and how much attention they are getting! Artists are also busy making nature installations around camp, in the form of camp emblem designs made out of wood and leaves. Others have spent time in the craft house working on glazing clay projects, making heart shaped candles, newspaper poetry and Origami mobiles. Despite all the activity we’ve already mentioned, there have still been plenty of trip adventures, and at this point everyone has been out on overnight excursions. Junior girls headed out to spend the night at Giant Washbowl (they were assisted by a rugged few Work groupers, who helped sherpa water to their campsite) and rise early in order to hike Giant and Rocky Peak ridge successfully the following day. 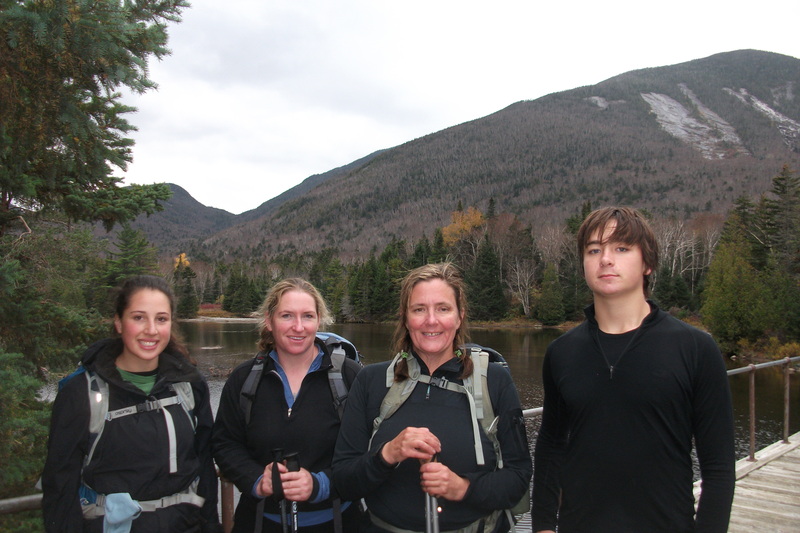 Another group hiked into Round Pond to camp, then hike Noonmark Mountain and enjoy its most beautiful views! Other girls enjoyed the natural beauty and wildlife that is so abundant on Keenan Pond, where they watched a great blue heron! Junior hikers backpacked into Gulf Brook after hiking Big and Little Crow, then hiked up Hurricane Mountain the next day. The Birdies followed their lead and have also been camping at Gulf Brook, while taking in the scenery from the Crows. Some senior girls ventured to Valcour Island for a service trip to collect garbage – with plenty of foresight, they packed an extra lunch, which came in handy when the winds picked up to make the waves impassable until later in the evening. We also managed to squeeze in a range of day trips throughout the past few weeks, including hikes up Street and Nye, Catamount and Tabletop. Blueberry hunters on both Pinnacle and Poko harvested enough fruit for the kitchen crew to make delicious Blueberry pancakes for everyone! At LINCOLN we’ve continued with the full array of activities each day, on the field, in the woods and on and in the lake. Ropes course, horseback riding, art shop, wood shop and mountain biking are popular and the field is quite busy, too. Our junior and senior baseball teams played several games against Camp Poko, as did the soccer and sailing teams. They were great, friendly competitions with lots of exciting moments. Both teams played hard, but good sportsmanship was evident throughout. In the end, the games were split right down the middle between the two camps; a perfect result even though it’s fun to win! We’ve had groups out on the field playing ultimate frisbee, capture the flag and rugby as well. The archery range and tennis courts are full of activity, and of course, with last week’s heat wave, the lake was the place to be! Kayakers paddled, rolled and played polo almost constantly under the guidance of Matt and Phil. Canoers and swimmers have been enjoying the weatherand sailors and windsurfers were treated to some very strong winds recently. Our resident fishermen are out as well and have boated many sunfish and bass! Activities and trips are the meat and potatoes of camp life, but perhaps special events are the cake! Last weekend, we held what has recently become our annual “final four” competition, where the camp splits into 4 groups, each representing a member of the NCC leadership team. This year’s event had teams representing Frau, Emily, Doug and Pete. Contests ranged from blindfolded tent set-up to soccer and culminated in an all-camp relay race, the final leg of which involved eating pudding from a bowl with no hands! It was a really fun day for everyone and, of course, each Sunday evening finds us down at the council ring for our Sunday night ritual; the council fire. Here we commend each other for good deeds and accomplishments over the past week. We also give out awards, discuss camp issues, sing some songs and tell a story. Sitting under the great pines and hemlocks, listening to a story and watching the sun sink on the other side of the lake is the perfect way to close out a week. At WHIPOORWILL, plenty of singing took place in preparation for parents’ visiting day, as boys and girls gathered to form this year’s group of Wheezlings, who gave a tremendous performance that evening. In addition, those campers who love to flex their vocal chords created new camp centric song lyrics for popular songs, and some girls learnt the art of beat boxing. Campers have taken a variety of movement instruction that included beginner’s ballroom, interpretive dance and yoga. Crafters made Japanese paper lanterns, stepping stones for the garden or ceramic candleholders, complete with candles inside. While morning activities remain focused on instruction and skill building, our afternoon choices continue to have a slightly more creative and whacky feel. And many of our activity ideas stem from camper requests: fishing, high ropes course, and fire building clinics made appearances, along with windsurf for advanced campers, mixed yoga, archery, a swim to Whip island this past week and a swim to Lincoln, too. In the craft house, campers made mobiles, magazine woven baskets and stuffed squirrels from gloves, while painters ventured onto Birdie beach to work on watercolors. Those who are particularly fond of Harry Potter took the opportunity to celebrate the character’s birthday during an afternoon of Hogwarts focused games. There was plenty of dressing up and magical fun throughout the event. Interest in trips continued as the summer progressed and girls were excited to hike the Dix range, despite a mix of weather. Birdies headed on a canoe overnight that navigated through Long Pond and Hoel Pond, where they had a fabulous time! The Work Group had a couple of excursions during their final week. For the first, they enjoyed a lunch cookout with the Lincoln Work Group on a sand bar on Lake Champlain. The second was solo camping on our cliff property, where they were responsible for hanging a tarp and spending the evening and night reflecting on their experience. The LINCOLN boys have been very busy over the past two weeks. As we pass the half-way mark of the summer, the focus of camp shifts slightly. Activities still occupy a huge part of our collective experience, but trips are becoming a much bigger part of the picture. Extended trips have begun in earnest with groups of boys heading out into the Adirondack wilderness for three, four, or even five days at a time. One group of boys paddled up the Bog River, into Lowe’s Lake, where they stayed two nights, enjoying the peace and quiet (except when broken by the haunting cry of a loon). Another lucky group spent four days paddling up (and back down) the Oswegatchie River, one of the wildest and most remote wilderness drainages in the park. The scenery is wild and beautiful, especially at their destination, the High Falls of the Oswegatchie. Another group paddled out onto Franklin Falls pond for an overnight trip. A very ambitious and strong group of boys spent four days camping and hiking in the Lake Colden area, climbing Herbert, Cliff, Redfield and Colden. Another group packed in from Elk Lake to climb the Dix range over three days. A cohort of cubs spent the night at Heart lake, where they climbed Mt. Jo and Phelps, while a group of juniors used Heart Lake as a base camp to climb Algonquin and Wright peak. Day trips have continued as well, with afternoon/evening paddles on the Ausable River and Lake Champlain; hiking trips up South Bouquet, Poko, Whiteface, Esther and Sawteeth; rock climbing ascents; and sailing trips on the Orion. The weather for these trips has, for the large part, been spectacular and the groups have returned happy and energized! As you know, weekends provide tons of entertainment, but few more than the mid-season weekend when GIRLS and BOYS gather to hold a County Fair on the Whip field. We had a truly magnificent circus-themed fair, which boasted booths created and run by campers, including such challenges as catching soda from the soda slide, dunking the counselor, arm wrestling, pillow fighting on the balance beam, riding the bucking bronco, throwing darts at balloons, and of course getting married at the marriage booth! The campers worked really hard coming up with ideas, decorations and costumes, to transform the field into a jolly fete that provided much fun for all. After dinner, we reconvened on the Lincoln field for an all-camp square dance called by our old friend Bruce. The whole camp whooped, swung their partners and do-si-doed around the field until it was too dark to continue. Everyone had a blast! With little time to recover from such festivities, we plunged into the next day with enthusiasm and anticipation of this year’s play, the musical “Bugsy Malone,” gathering in the Red Barn for a matinee performance that was executed to perfection by a cast of more than fifty girls and boys, directed by Bea, Sean, Molly, Lainie and James. As a special treat afterwards, we held a cupcake party that was a real hit with everyone. Each camper chose a cupcake that had been decorated by the Birdies and Cubs that morning. During the last two weeks GIRLS and BOYS joined together for afternoons of tennis and badminton at Whippoorwill and sand volleyball at Lincoln. A group of Workgroupers from Lincoln and from Whippoorwill set off on a four day backpacking adventure, climbing only trailless peaks in the Dix range. They had a great time navigating by map and compass, fording streams and getting a taste for what mountain climbing was like before the trails made it “easy.” Boys and girls met for final social events on Friday and again for our last concert of the season on Saturday evening. It was a very fun combination of funny skits and impressive musical performances, capped off, of course, by the Wheezers. Sunday morning found us all up in the horse field to watch the annual horse show. Those boys and girls who have been up at the stables a lot this summer were eager to show off their skills and the crowd was treated to races, jumps and even a costume relay. Riders worked very hard under the direction of Laura, Michael, James and Kelly and it was a fun morning for everyone. Workgroupers have continued to help out at our local organic vegetable farm, picking veggies, weeding and learning about farming from the energetic young farmers there. And, they’ve been hard at work on their lean-to. Since we last wrote, the lean-to was erected, taken apart, floated like a raft across the lake to its new site and then re-erected in the woods where it will be used on overnights by generations to come. On the day of the the Farrington Cup race at Whippoorwill, sailors could not have asked for better wind. It was a nail biting start, as the first heat saw all four boats pass the finish line within yards of one another. There was phenomenal sailing displayed by all participants, so everyone should feel very proud of their participation. Our last weekend at camp saw a string of special activities to close out the season. Sunday evening was our much anticipated final banquet. The themes (chosen by the campers several weeks ago) were Las Vegas at Lincoln and “Inside a garbage can” at Whip. Campers in costume were amazed as they entered the lodges. In one afternoon teams of boys and girls had transformed the dining halls into the Las Vegas strip and…the inside of a garbage can. Our fantastic cooks pulled out all the stops with a delicious meal and it was a terrific celebration. Monday was spent packing up and starting to pack away the camp for winter, with many boys and girls taking one last dip in Augur Lake. We held our final council fire that evening, where there was much recognition of accomplishments and good deeds done over the summer. At Lincoln, awards were given, songs sung and we watched a slide show of images from this camp season, while at Whippoorwill, we exchanged peanut presents and sang camp favorites while the sun set one last time over Augur lake. There were many tears at the thought of leaving camp, but we had a good time together and went to bed with a mix of sadness and excitement. It was a great summer, and we are already planning for 2014. It promises to be at least as exciting and fun! You can register now on our website: www.northcountrycamps.com We hope to see you there! With the most fantastic early spring weather, we are counting the days until the 2012 summer season begins at North Country Camps. The lake melted early this year, giving us high hopes of having balmy temperatures to get cabins opened up and cleaned, tennis courts prepared, docks in the lake and gardens planted with vegetables, herbs and flowers. We are having fun planning fun new adventures for trip groups and brainstorming twists on traditional activities. We welcome ideas of new things that can be incorporated into our already vibrant programs. Enrollment is coming along nicely and we’re thrilled with our newest edition of the North Country Camps brochure. Let us know if we can send you some to share with friends and colleagues, since it’s certainly not too late to recommend us to families who are still looking for a wonderful summer experience for their children. It’s just 63 days until camp officially starts. We look forward to opening our doors in just a couple of months! 2012 NCC Augur Lake Ice out contest! The Augur Lake Ice-Out Prediction Committee is poised to take your 2012 predictions for this most unusual of winters! Attached for your reference is a photo taken yesterday showing a stretch of open water off Hulls’ point. That open water is an anomaly, because a narrower version of it also appeared earlier in the winter, when Peter’s ice boat was flying back and forth across the lake. What it means is anybody’s guess…. Good Luck! It feels like a while since the summer ended and as our last post demonstrated, the colors in the Adirondacks have been spectacular as usual this fall. So a small group of staff set out on an adventure to hike Colden, with hopes of catching the last of the Autumn hues. Knowing full well, that the weather can be changeable in the higher elevations, we were well prepared for colder temperatures and gusty winds. The morning was brisk and overcast, as we set out from the South Meadow road, yet we felt optimistic that there was a wonderful day ahead of us. We reached Marcy Dam in good time and took the opportunity to survey the mountain that we planned to scale. It was also a chance to see in person, the remnants of Marcy Dam and the missing bridge, that got washed away during the Tropical storm, Irene. Hikers can still hike from the Adirondack Loj, but need to forge the river down stream of where the bridge used to be. You can see in the photo that the water is very high again, because since the dam burst, the pond has tended to be more of a small stream. On this day, it almost looked as full as we’d remembered it from past visits. As we cast our eyes towards Colden, we saw what appeared to be snow on the peak. It was hard to tell how much snow, but it was most definitely snow!! After signing in at the register, we hiked on through golden, red, yellow and brown leaves, climbing ever higher. The colors were especially pretty next the evergreens and gurgling streams. When we reached Lake Arnold, the trail started to wind upwards in a more determined fashion and as the elevation got higher, the temperature got lower. Like magic, we hiked from Fall, into Winter. It was like traveling in time. As the tree line got shorter, the branches were more heavily laden with snow. We burst out on top of Little Colden, where the wind took one’s breath away as it slapped you in the face with full force. The exposed rock was running with water that was turning to ice in places, so extra caution was used. After a welcome dip back into the trees, we took the opportunity to add further layers and have a snack before making a last upward push to the Summit of Colden. From here, we enjoyed views of the MacIntyre Range and of Mount Marcy as the skies cleared long enough to show the neighboring peaks. We quickly made our way down and stopped again at Lake Arnold for lunch number 7, while basked in the relative warmth of the sun, before trekking on back towards the parking lot. But we had to have an after shot too! We wish you could have been there with us and we look forward to the next time we get to hike with campers from North Country Camps on a perfect TAD! Doug and Emily spent a day skiing in to Avalanche Lake from Heart Lake a few weeks ago. This sort of trip isn’t for those who are wanting a simple day out on cross-country skis, in fact this is a trail that so many of you have traveled by foot – some of you many times – and it’s quite a haul up through “misery mile”. Just last summer Barry led a group of campers up Colden’s trap dyke from Avalanche Lake. Looking at the photos of snow and ice-covered cliffs, it is hard to imagine green leaves, Adirondack mud, exposed rocks and boulders, open water and waves on the lake, and the smells of summer. For those of you who have carried your packs on this trail – imagine the fun of skiing back down to Marcy Dam!